We’ll show you some nontraditional ways and reasons to sell For Sale By Owner in the Bronx in this article. 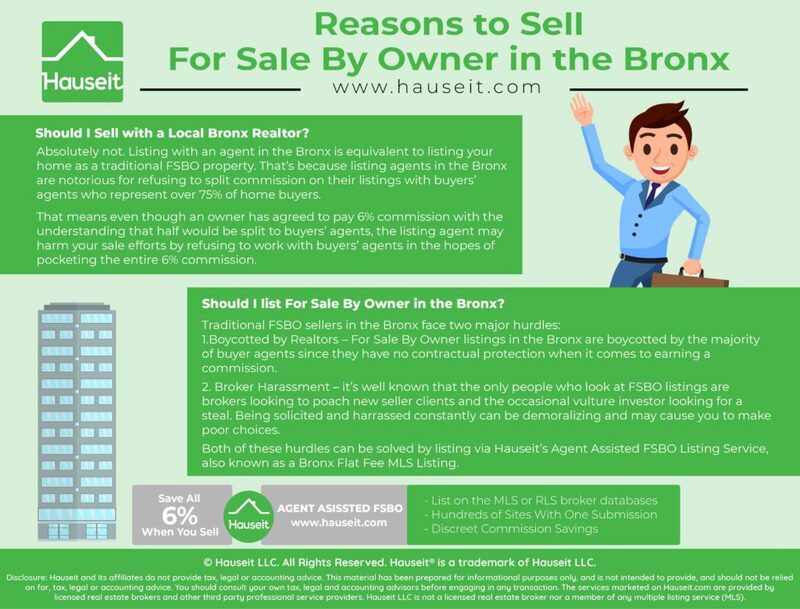 Unfortunately for home sellers in the Bronx, traditional For Sale By Owner (“FSBO”) is as bad an idea as selling with a local Bronx Realtor. With both approaches, you’ll have to deal with an inordinate amount of barely educated agents trying to poach your listing or acting against your interests. What can a savvy home seller do to save money while getting full exposure? Should I sell with a local Bronx Realtor? Should I list For Sale By Owner in the Bronx? Should I purchase a Bronx flat fee MLS listing? Is it harder to sell property in the Bronx? Absolutely not. Listing with an agent in the Bronx is equivalent to listing your home as a traditional For Sale By Owner property. That’s because listing agents in the Bronx are notorious for refusing to split commission on their listings with buyers’ agents. That means even though the owner has agreed to pay 6% commission with the understanding that half would be split to buyers’ agents, the listing agent is acting selfishly by refusing to work with buyers’ agents to increase the chances of finding an unrepresented buyer and earning all 6% for themselves. This behavior is extremely unethical and detrimental to the best interests of the seller. Furthermore, it is illegal according to New York Real Estate License Law to refuse to honor a buyer’s right to work with a broker of his or her choice. That’s calling not dealing fairly with all parties. Unfortunately for home sellers in the Bronx, listing agents refusing to co-broke with buyers’ agents is a very common occurrence. Refusing to co-broke and work with buyers’ agents is a major breach of a listing agent’s fiduciary duty to their seller. That’s because 90% of all home buyers are represented by buyers’ agents, and the whole point of listing with a real estate agent in the first place is to be able to access these represented buyers through the concept of co-broking. As a result, the exposure your home would receive if your listing agent decides not to co-broke would be the exact same if you had taken the same photos and listing description and posted it yourself online as a For Sale By Owner listing. What a scam! Just because listing with a Bronx Realtor is as expensive as it is useless, this does not mean you should rush to list your home as a traditional For Sale By Owner listing online. Traditional For Sale By Owner listings on popular real estate search websites face two major problems. 1. Boycotted by Realtors – since there is no mechanism for buyers’ agents to be protected and paid for introducing their clients, For Sale By Owner listings in the Bronx are boycotted by brokers. As a result, your listing is technically “off market” due to the fact that the 90% of home buyers represented by buyers’ agents aren’t engaging your listing. 2. Broker harassment – it’s well known that the only people who look at For Sale By Owner listings are real estate agents looking to poach a new seller client and the occasional vulture investor looking for a steal. Unfortunately for home owners trying to sell For Sale By Owner in the Bronx, there are over 50,000 licensed real estate agents in the New York City metro area who will be calling, emailing and visiting. They will not all be nice, and many of them will repeatedly call on you even after you’ve turned down their services. Sometimes really bad real estate agents will downright threaten and physically harass home sellers! Note: As reported in the New York Times recently, a SoHo For Sale By Owner seller was scratched in the face when he had to physically remove an unruly real estate agent who had been soliciting him at his open house! If this happened in SoHo, what might happen in the Bronx? Yes; however, it’s very important that you diligence the flat fee MLS listing service before signing up. Home owners trying to sell For Sale By Owner in the Bronx through a flat fee MLS listing are often duped for two reasons. 1. Being listed on the wrong MLS – Be very careful about signing up with a For Sale By Owner website that promises to list you on your local MLS in all 50 states. These “national” For Sale By Owner websites are generally a scam for New York City home sellers because NYC doesn’t have a dominant MLS in place. Instead, the dominant trade organization in town is the Real Estate Board of New York (REBNY), which operates an equivalent to the MLS called the RLS (REBNY Listing Service). With many of these “national” For Sale By Owner websites, you run the risk of paying up to $1,000 on a flat fee MLS listing that doesn’t even get you into a relevant NYC broker database! 2. Being boycotted by Realtors – Why would buyers’ agents boycott your listing if it’s in the MLS? There’s a reason why more agents haven’t signed up to be flat fee MLS listing agents themselves. Most of these flat fee MLS listing websites and discount brokers make it completely obvious what they are doing. This is not a good thing as advertising that you’re willing to work for free hurts your reputation with other brokers. Furthermore, most of them have reputations among the brokerage community as “sketchy discount brokers” who are boycotted in the first place. All a buyer’s agent has to do is search for the flat fee listing broker’s name to find out what they’re up to. As soon as it becomes obvious that this is an irregular listing, some buyers’ agents will decide to pass and instead send their buyers other similar listings where there is no doubt in getting paid. There is naturally resentment towards “shady discount brokers” who are advertising loudly that they’ll work for free and are constantly talking trash in public about the rest of the brokerage community. Unfortunately for these misguided souls, you need the cooperation of buyers’ agents to reliably sell your listings. Fortunately for home owners looking to sell For Sale By Owner in the Bronx, it’s possible to list your home online for a flat fee with a traditional broker who has none of the stigma associated with a discount broker. 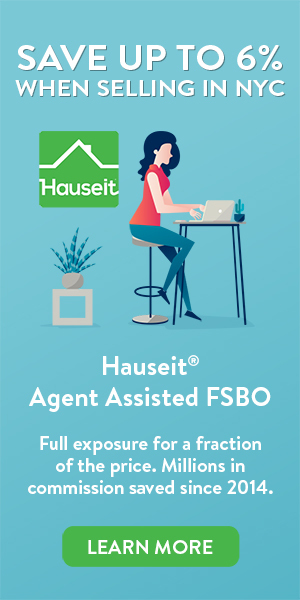 Through Hauseit’s many brand name brokerage partners, your listing will appear as a traditional listing, and buyers’ agents can’t tell that you’ve received a break in commission. The only difference will be that you’ll handle all of the inquiries, scheduling, showings and negotiation. As we’ve learned through years of experience, the only way to get the same exposure as a traditional 6% listing broker is to work with a traditional broker who normally charges 6%! It’s actually easier to sell property in the Bronx due to the decreased competition from unethical listing agents refusing to co-broke. As a result, most of your competition in the Bronx is effectively off market. That’s why home owners who decide to sell For Sale By Owner in the Bronx through Hauseit’s List Your Home Online service will have a significant edge in marketing and exposure versus comparable listings in the Bronx. Just imagine, you’ll be one of the few sellers in the Bronx who are able to fully engage all buyers, including those represented by buyers’ agents. Assuming you’ve taken professional photos and priced your property correctly, your listing should not only sell faster but sell for more than comparable off market listings in the Bronx!